American Story is an album that pays homage to old-timey string bands but not without youthful abandon and pop undertones. For fans of the Wailin' Jennys and Dixie Chicks, it is historical and autobiographical and it is profoundly fun – showcasing the new incarnation of the group with singers Nora Jane Struthers and Todd Grebe at the helm. Founding members Angela Oudean (fiddle) and Jason Norris (mandolin) added a new multi-talented rhythm player, the bassist-drummer (and sometimes banjo-picking) PJ George. It's a commonplace that crises create opportunities, but the principle was thoroughly—and successfully—tested by Alaska-by-way-of-Nashville's Bearfoot last year, when original members Angela Oudean and Jason Norris found themselves presiding over a prolonged period of shifting personnel. Yet the cliché proved true in the end when the pair recruited Todd Grebe, another Alaska-to-Nashville transplant, Nora Jane Struthers, a rising young singer/songwriter andone of her bandmates, P. J. George, to create a renewed ensemble full of energy and creativity. And now, with the release of American Story (available Sept 27), the group's latest effort for Compass Records, it's plain to see that the crisis was little more than a blessing in disguise. Following the success of Bearfoot's 2009 Compass debut, Doors And Windows, which debuted at # 1 on the Billboard Bluegrass chart, American Story introduces three new members, showing off both their distinctive voices and the impressive level of integration the quintet's already achieved. Lead singer, songwriter and guitar player Nora Jane Struthers is the best known of the additions, having already released one stellar album highlighting her thoughtful songwriting and cool, clear voice—and having won the tough Telluride Bluegrass Festival Band Competition in 2010 with her Bootleggers, a group featuring the second new member of Bearfoot, bass player P. J. George. Rounding out the revamped lineup is guitarist/vocalist Todd Grebe, previously known for his work fronting the acoustic honky-tonk group Todd Grebe & Cold Country. And while the group claim that they're still settling into their new sound, one listen to American Story offers compelling evidence that they're being more modest than accurate. With veteran producer/engineer Brent Truitt at the helm, Bearfoot hits the ground running on the new project with the Struthers-penned opener, "Tell Me A Story." With its restrained prologue and keenly rhythmic body, the song dishes up a healthy serving of the band's strong points: a winningly intimate lead vocal, tight harmonies, and an arrangement that weaves together a multiplicity of musical strands, from the string band and bluegrass music that made up Bearfoot's earliest sounds to a unique take on the acoustic pop influences whirling around the group's East Nashville home. "This song, and in some ways, this album, is really about escapism," says Nora Jane. "We all have different ways of removing ourselves from reality, and I get myself lost in stories." From there, it's a swift, satisfying run through a dazzling array of sounds and stories to the easy, good-time lope of Grebe's closing "Mr. Moonshine." Along the way, there are stops for hard-core bluegrass ("Midnight in Montana" with help from guest Charlie Cushman on banjo), a sly and sultry come-on ("When You're Away," written by the entire group), the poignant and ominous portrait of a trapped woman in "Eyes Cast Down" (written by Struthers and Claire Lynch) and much more—true stories and tall tales, but always with real people and real situations at their center. "I really connect with those lyrics," Jason Norris says of "Feel Free" (written by Struthers and Tim O'Brien). "When Nora Jane first played it for us, I thought 'Wow, that could actually have been written by me,'" he adds, and in truth, the sentiment could as easily come from a listener. Adding to the project's depth, Truitt and Bearfoot haven't been afraid to explore new sonic territory, deftly blending the group's acoustic instruments with touches of percussion, electric bass, accordion, banjo and more—many of them supplied by P. J. George, who serves as the group's gifted utility man—yet always, each touch appears to underline, rather than draw attention from the songs. "I love that the entire album has a really rockin' element to it, with more energy than we've ever had before," Oudean observes—From start to finish, it's an album of distinctive music that remains deeply authentic, true to the band's rootsy origins even as it steps into more sophisticated musical territory. 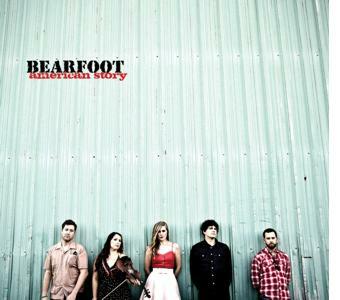 American Story would be a strong collection coming from a veteran artist and it's certainly true that the individual members of Bearfoot, old and new, are, while still young, genuine veterans. Yet it's all the more impressive for being the product of a group that has yet to celebrate its first anniversary as an ensemble. That makes for a great story, and for an even greater appreciation of American Story, but as the members of Bearfoot would be the first to point out, in the end the only thing that matters is the music; here it is, and it's mighty fine.